Montclair State University hosted workshops Friday for federal employees who are not working because the federal government is partially closed. 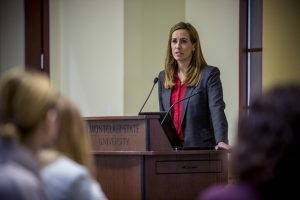 U.S. Rep. Mikie Sherrill speaks at Montclair State University on Jan. 18 during a training event for furloughed federal government workers. President Donald Trump and Congress partially shut down the government on Dec. 22, 2018, by failing to agree to compromise legislation on funding several branches of the federal government. Trump is demanding $5.7 billion to build a wall on the Mexican-American border. Congressional Democrats refuse to fund it. Montclair State University President Susan Cole addressed the workers. Cole introduced U.S. Rep. Mikie Sherrill, D-11 District. Sherrill thanked federal workers and lamented their being pawns of political fighting. Peter McAliney, executive director of Continuing and Professional Education at Montclair State University, helped organize the training after hearing The American University in Washington, D.C., did the same training. The training was organized by Montclair State’s Continuing and Professional Education, Communications and Marketing, and the President’s Office. About 12 federal workers came to the training. Linda Flynn, director of career services in the student success center in the College of Education and Human Services at Montclair State University, gave a discussion on LinkedIn with the goal of making professional connections and seeking jobs. For instance, a person seeking a sales position might call his or her skills business development. Event planning is also called project development. Flynn advised federal workers to upload a photograph to their LinkedIn profile because it results in 14 times more people viewing it and to add the geographic areas in which they are looking for jobs. On the subject of endorsements, Flynn said she has received endorsements from people who she met at professional conferences. Some people feel comfortable asking for recommendations. Flynn advised people to include their education yet not put their year of graduation if they feel uncomfortable about their age being a focus. Flynn advised workers to use LinkedIn to publish articles, to follow professional development organizations, and to turn off sharing profile edits. This is giving them interview experience without the risks, she said. Daphne Galkin and Danielle Insalaco-Egan of Montclair State University gave training on developing authentic leadership at any level and finding and using their internal compass. Galkin asked workers to name authentic leaders. “Think about people in your life and what values they encompass,” Galkin said. Galkin discussed using one’s values to be an authentic leader and that they should own their mistakes. “Owning your mistakes is not apologizing for putting forth an opinion,” Galkin said.